Ouch! 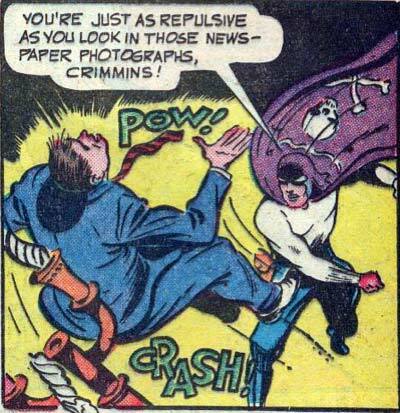 He punched out criminal mastermind Crimmins with his bleeding fist after that rusty knife fiasco! IRONY, n. : Some bozo in a purple cape and cowl marked with skull and crossbones, a white turtleneck, and blue slacks calling anyone else repulsive. What about the candelabra? Doesn’t anyone care what happened to the poor candelabra!?! Bell from Beauty and the Beast is still crying about the candelabra. It was her best friend before this incident.